H1Z1, SOE’s multiplayer zombie survival affair, hit Steam Early Access today. Well, almost. Unfortunately, a problem more devastation than the zombie apocalypse has left players and people watching the game on Twitch stuck, staring at a login screen. SOE President John Smedley wrote that the login server was being reconfigured on Twitter. 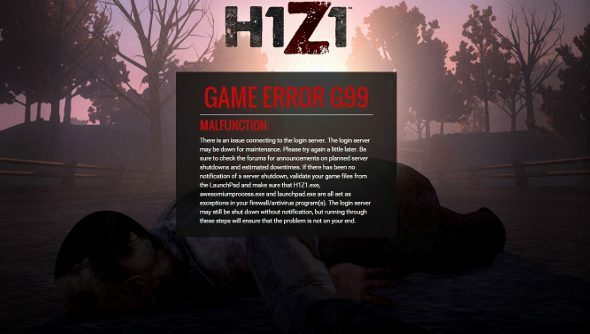 Since that was a better part of an hour ago, I just checked again, and was immediately kicked out of the game, to the H1Z1 site, where I was greeted with the G99 error page. A second attempt didn’t even get that far, and wouldn’t let me get past the launcher. Nick’s still streaming the launch, but until this is fixed, you’ll just have to watch him play Hearthstone instead.